While we were on our honeymoon, Gary and I were trying to figure out a tradition that we could start as a married couple - little chotskies are always fun to pick up for the house, but we wanted something with a little back story - so we settled on ornaments from all the cities we'd visit together as husband & wife! Quickly forgetting our agreement, as soon as our plane took off from Hawaii we both realized we forgot an ornament, so we settled on our second destination for our honeymoon, San Francisco! We did manage to pick up an engraved piece of wood from the luau we went to in Maui so maybe we'll just count that! Our first anniversary trip to Paris (forgot to pick up an ornament in London) & our second anniversary trip to Puerto Rico. Scooped this pretty different one up from New Orleans this year as well. Of course my favorite ornament doesn't actually come from a place we visited together, but rather the ornament I picked up for our first married Christmas. ***************************************** I saw a few Christmas Q&A's floating around so I thought I'd partake in the fun! As far as other traditions go, if we're home - which will only be the second time for us this year I like to make a breakfast quiche. I usually make it the night before and all we have to do is heat it up in the morning. We're also going to be seeing a performance of Once the day after Christmas - a Broadway show (not on Broadway) is always a fun treat! I absolutely love Last Christmas by Wham, with Mariah Carey's All I Want for Christmas in a close second. Do you decorate before or after Thanksgiving? Strict rules over here - not a day before Thanksgiving...usually the next day though because I can't hold out much longer! Peppermint or Gingerbread? I'd have to go with Gingerbread - peppermint is too strong from me, but if we're going with cookie flavors hands down sugar cookies! 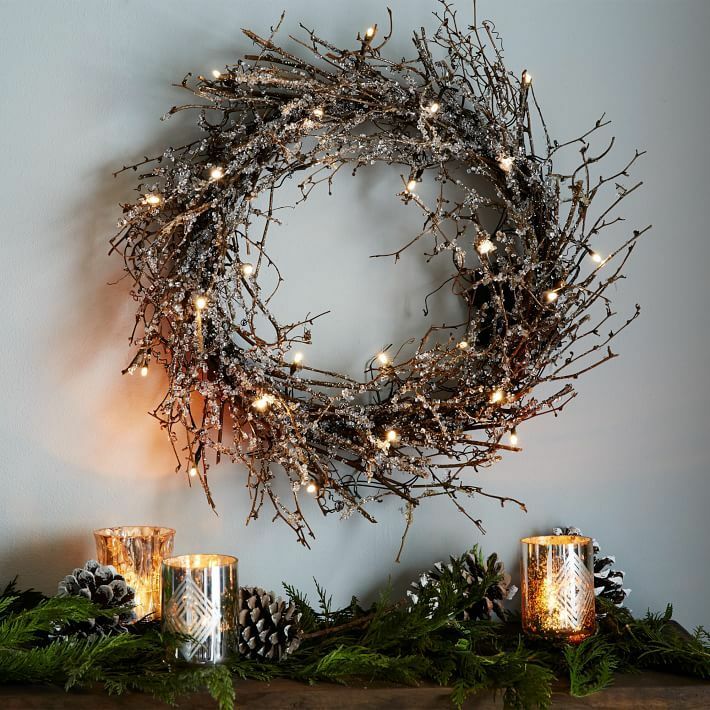 via I'd say Garland...Tinsel seems like more of a headache to clean up! Favorite Holiday Cocktail? My friend made mixed prosecco with cranberry juice and then garnished it with cranberries & mint - it was amazing! What's your go-to stocking stuffer? Ah it's terrible, but I always get Gary a starbucks gift card, it's a win-win because I know he'll use it (within days) and it's an easy buy! What's your favorite Christmas Ornament that you own? Any fun family traditions? I have an ornament from Paris that I love. My mom gifted me a few from their tree when I got my own house.. I love those as well! We do ornaments as well. I love looking at our tree and remembering all the places we have been. We're going to need a bigger tree. Merry Christmas! Great ornaments and so so sweet!! I love the Q and A. My favorite ornament is one my Mom still has that she will pass down to me. A little angel with blonde hair that feels real which was the first ornament I ever placed on a tree while my dad held me up because I wanted to place it high up. loll. She places it high up still on hers. Merry Christmas beautiful!! My husband and I started that tradition early on too, and it is so fun to look back on those trips when we decorate our tree each year. I thought I was the only one who loves that Wham song. My husband laughs at me every time it comes on the radio. What a fun tradition with the ornaments!! I always get Nathan Starbucks cards too. I mean, who doesn't like free Starbucks?! Love your ornaments! Scott and I really need to start something like this- I've realized that as I'm using his aunt's Hallmark ornaments from the '80s for the second year in a row, that we don't have many of our "own" ornaments!! the ornaments are so cute! i decorate the day after thanksgiving if i have nothing else going on, otherwise it ends up being way delayed! the worst. that wreath is so pretty btw! have a merry christmas girly!! Loved seeing your ornaments from your travels! I love a good themed tree like the next person, but there's something so special about a tree covered in personal ornaments. From travels, to symbolize an event in your life. Those are my favorite. I find it fascinating to look at people's trees. (: Merry Christmas Biana! We do the ornament tradition, too! I'm hoping to get some fun ornaments on our last trip this year. Your NOLA one is fabulous! Merry Christmas! Griffin and I started the tradition of getting ornaments everywhere we went as well during our honeymoon! But we then quickly forgot too haha! I think the last two places we went to we forgot to get ornaments! :( Starbucks gift cards are always the best stocking stuffers! I hope you have a very Merry Christmas! I love all of your travel ornaments! That's such a cute idea! Biana, I love how ornaments can be a reminder each year of where you have been or milestones you have made. Great ornaments and a nice personal post. Have a very Merry Christmas! I love special ornaments that have such heart felt meaning in them. The wedding dress & tux one is my fav!!!! That's a really nice tradition and way to remember all the fun travel you guys have done! I always used to collect ornaments when my family and I traveled somewhere new! Such a great way to treasure those memories! I have collected lots of ornaments over the years, it's a great tradition. I buy each of my children an ornament every year so that when they leave home they will have at least 18 or so to take with them for their own trees. My favorite ornament is one that was given to me by my parents best friends when I was 3, an angel, it reminds me of home! K and I also collect ornaments from our travels and I was meaning to post about it....I still collect shot glasses but my cabinet is bursting at the seams so I really need to stop and focus on the ornaments now. lol Prosecco with cranberry sounds so light and refreshing! 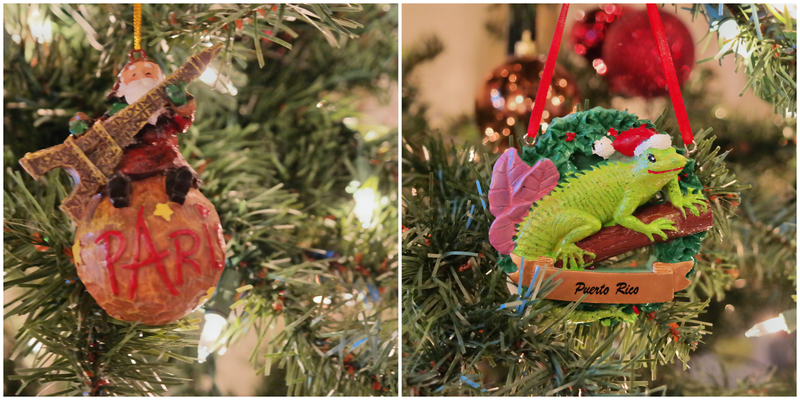 I love the travel ornament tradition! We try to collect ornaments as we go, but we always forget oops! We have a bride and groom ornament that my mom's friend bought us and I cherish it, too! I love that your ornaments have stories--only a few of mine do and the rest I just bought because they were pretty haha! I have that same cable car ornament from SF! I like picking up an ornament anywhere I travel, so there's a little travel branch on my tree. Every year I try to make sure there's an addition to the travel branch! I love the tradition of having an ornament from everywhere you visit as a couple! They all just hold so many memories from special times that you were together! I totally agree with you about the garland over tinsel! It's easier to clean, but I think that it looks prettier too. What a great collection of ornaments and such a fun backstory! As for the questionnaire, I'd have to go with gingerbread too! I get sick of peppermint way too quickly! Have a wonderful holiday! I love that you guys do the ornaments from all the cities that you have been too. I need to start picking those up when I travel! Would much rather have collectible ornaments than other stuff that sits around unused. I hope you have a very Merry Christmas! I love that tradition! It's the perfect one and it doesn't have to mess up your house! aww i love that bride and groom ornament, we have the same one! and i always forget to buy ornaments in the actual place, so sometimes i buy them online when i get home which is totally cheating but whatever, memories lol. about 50% are online, 50% are actually bought in the city. last christmas is my fave as well! i do the same with my ornaments--most of them are from my travels. always good memories when i pull them out every year. i think starbucks is the best idea for stocking stuffers--love that and you're right, it will always be used!! Last Christmas is my favorite Christmas song too! I never get tired of it! OMG, we get ornaments everywhere we go too! We started it on our honeymoon in Maui as well. Twinsies! Great idea, I think. I love a personalized Christmas tree! I love your ornament tradition! So cute! Definitely garland and we try to haul out the decorations the weekend after Thanksgiving. Merry Christmas! Caleb and I love to pick up new ornaments from places we go! Although we've been a little negligent and forgot on our honeymoon!! Yikes, lol! I love the Paris ornament so much! Merry Christmas, girl! I love picking up and receiving new ornaments! My dad has started to pass on family ornaments to me each year, which I love! Merry Christmas! We are going to start the traveling ornament tradition - I love that! We have one from our Hawaiian honeymoon and it made me so happy to pull out this year, that I decided we need to collect them from every destination :) Merry Christmas, girlfriend! 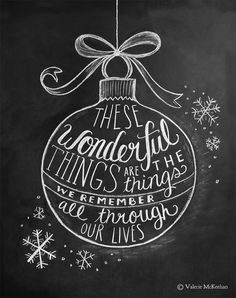 Love this post!That is such a great tradition with the ornaments...I may need to steal that idea :) Merry Christmas!! We collect ornaments on trips too and it makes Christmas so special when we unpack them and put them on the tree! Love this! Stephen and I decided to do ornaments to each other too - such a great tradition! What an amazing tradition. I love ornaments and I definitely love and approve of this tradition. That cocktail from your friend sounds delish and I too prefer garland to tinsel. Have a Merry and Bright Christmas Celebration with Gary and save me some quiche, girl! Love this - such a cute post! Ya'lls ornaments are presh! Love your ornament tradition! That is so sweet! Brian and I do the same thing when we travel, but we collect picture frames from all of our travel destinations. I think we have around 40 or 50 now and they're all displayed in the loft area of our second floor. I'm planning a blog post for it next year before I start recapping our past vacations. I can't wait! And now I'm wishing we had done ornaments as well! Lol. I love picking ornaments and seeing other peoples ornaments and what they represent. Especially the ornaments that I handmade when I was younger, such a nice thing to look back on! Merry Christmas girl, hope you have a wonderful holiday! We have ornaments or magnets or mugs from everywhere we've been, pretty much...except Chicago! What a cool idea!!! Happy holidays! We have the same tradition and I LOVE going to new places and finding an ornament to hang on the tree. However, part of me wants to do a themed tree next year soooo.. we'll see how that goes!! That trolley is way too cute! This is soooo cute! What a great idea! Thanks for sharing! This was such a fun post to read! I think that's so cute that you started the tradition of getting ornaments from places you travel to as a married couple. I'm loving the first Christmas one, so beautiful! You also chose two of my favorite Christmas songs :) I hope you're having a lovely day so far and thanks so much for sharing! A very fun read, thank you!! And those ornaments were so cute! Nice ideas for Christmas, these look really cute!!! I love the idea of picking up ornaments when you travel. I think I need to get after that!! ;) love the wedding gown + tux too!! Merry Christmas to you both! My husband and I also love to pick up ornaments from places we've visited together. One day we will actually spend Christmas at out home and get to put them up! You have adorable ornaments! I love all of them, but my favorite is the gown + tux one! Merry Christmas and I hope you have a wonderful day with your loved ones! Such cute ornaments. Merry Christmas! What a fun tradition to pick up ornaments from every city you visit! You will have so many memories from that for time to come! This was my first year really decorating for christmas... it was awesome but there's a lot of room for improvement. We get a fridge magnet from where ever we think travel to. I did get a Christmas ornament from our honeymoon cruise of Santa sitting on a starfish. I used to collect a coffee mug from places we visited but a person runs out of cabinet space fast that way. I have to disagree with you though, peppermint is yum! I love the idea of having a tradition like this, and the ornaments are such a wonderful idea. We do the exact same thing with ornaments from all the places that we travel! We actually got that idea from my parents (psst - I have that same San Fran ornament from when my parents visited. :) ) I'm definitely trying the prosecco with cranberry juice since I love it with POM juice! My Dad gave me my ornament from the year I was born. I will cherish that one. The ornaments are a fun tradition.